Not enough space or light in your cramped apartment? Then strap an addition to the side of your building and expand your living area and access to daylight and views. 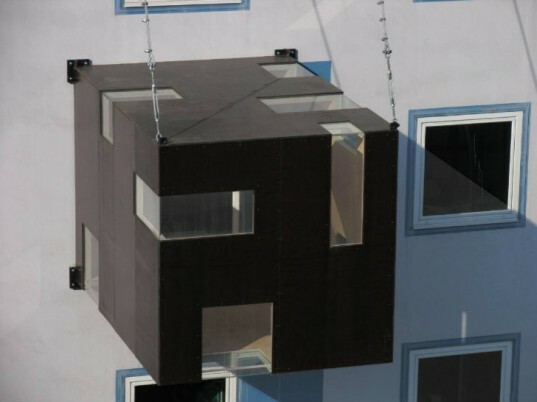 Designed by Stefan Eberstadt, the Rucksack House (backpack house) is a an additional room that can be suspended from the façade of any residential building. Mobile and lightweight, the extra room is both minimalist and spacious, providing nine whole square meters of additional space. Rucksack House is perched on the edge of both sculpture and architecture as well as on the side of a building. Eberstadt’s add-on room is constructed of a welded steel cage with a light birch veneered plywood interior cladding. The outside is clad with exterior grade plywood with an absorbent resin surface punctuated by plexiglas inserts. The room is suspended from steel cables that are anchored to the roof or to the facade of the existing building. Entrance to the room is gained via an existing window, and once inside, it is spacious and naturally daylit. With 9 sq meters (97 sq ft) of space, the Rucksack House is open and can be used for a variety of activities like an extra bedroom, studio space or a living area. Built-in furniture makes the space more usable, but still open. Sections of the walls unfold, with the help of hidden magnets, into a desk, shelves, and a platform for reading or sleeping. The entire box is mobile and can move as the resident does to the next dwelling providing instant add-on space. In 2004, the Rucksack House was in Leipzig, then in Cologne in 2005 and then moved to Bamberg in 2011. Rucksack House is perched on the edge of both sculpture and architecture as well as on the side of a building. Eberstadt's add on room is constructed with a welded steel cage with a light birch veneered plywood interior cladding. The outside is clad with exterior grade plywood with an absorbent resin surface punctuated by plexiglas inserts. 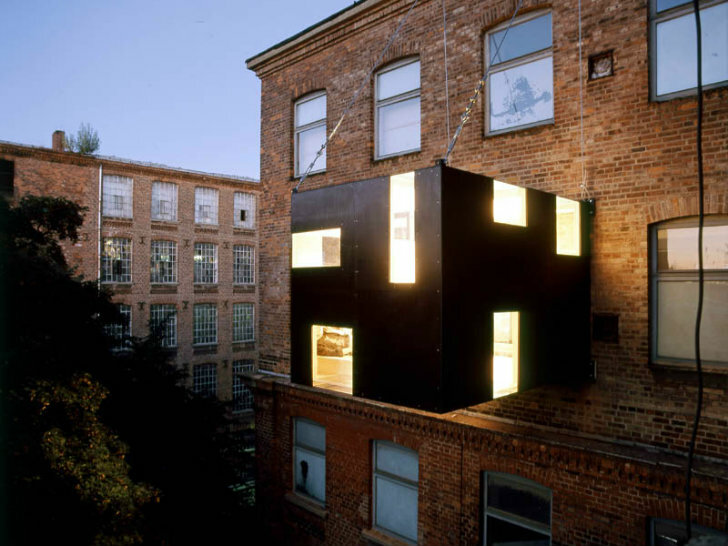 The room is suspended from steel cables that are anchored to the roof or to the facade of the existing building. Entrance to the room is gained via an existing window, and once inside, it is spacious and naturally daylit. With 9 sq meters (97 sq ft) of space, the Rucksack House is open and can be used for a variety of activities like an extra bedroom, studio space or a living area. Built in furniture makes the space more usable, but still open. The entire box is mobile and can move as the resident does to the next dwelling providing instant add on space.